« Making Your Brand Memorable in Video. 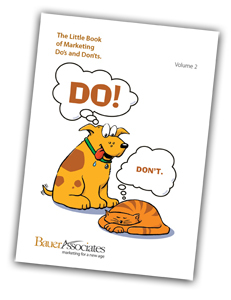 The second edition of The Little Book of Marketing Do’s and Don’ts is hot off the press. It’s a full-color, illustrated collection of the popular “Do’s and Don’ts” that accompany each issue of PrintStrategist. We would love to mail you a gift copy in appreciation of your loyal readership throughout the year. Just send an email request to Larry Bauer. And if you have time, let us know what you did for corporate gift-giving this year. Then relax, turn off the digital devices and enjoy a wonderful holiday season.